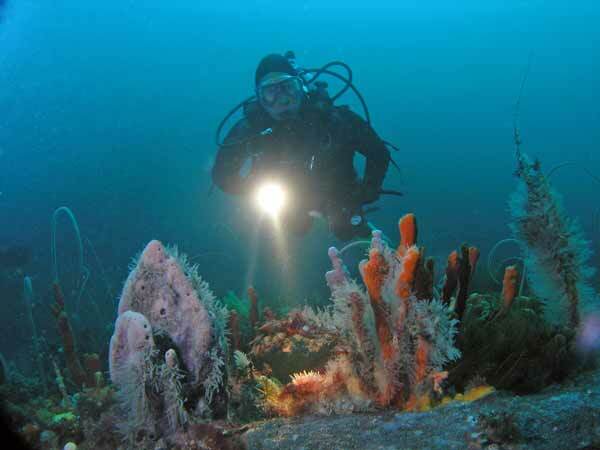 The Governor Island Marine Reserve at Bicheno on Tasmania's east cost has some of Australia's best reef diving. 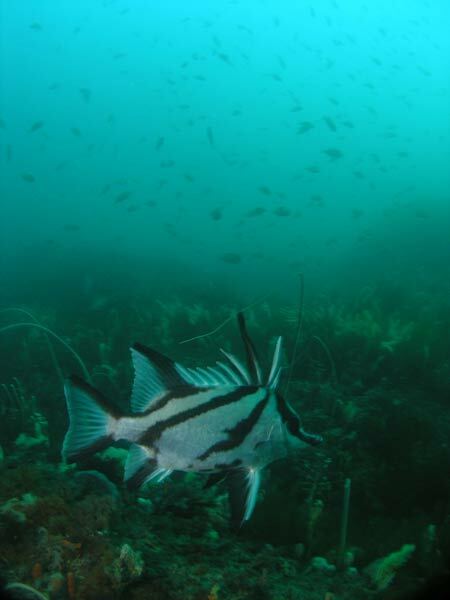 This diving is not for the new diver, as most dives are relatively deep (over 30 metres), but is certainly worth the effort of travelling there from places like Sydney. 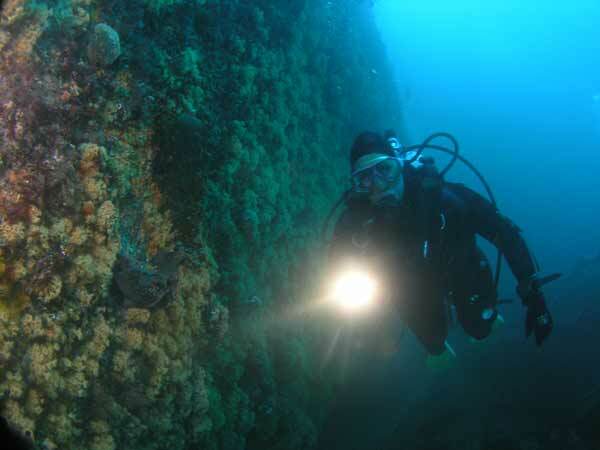 One of the best dive sites is called The Canyon. This is located on the east side of the southern end of Governor Island. A GPS Reading of 41º 52' 08.6"S 148º 19' 00.6"E (using WGS84) will put you over the reef. Once in the water, drop to the reef at about 18 metres. If you head north-east you will drop over the vertical wall that makes up the actual canyon. This is a sand bottom indent into the reef that starts off about 20 metres wide at the ocean side. The Canyon runs east west. Go out to the mouth of the canyon and the depth on the sand is about 37 metres. 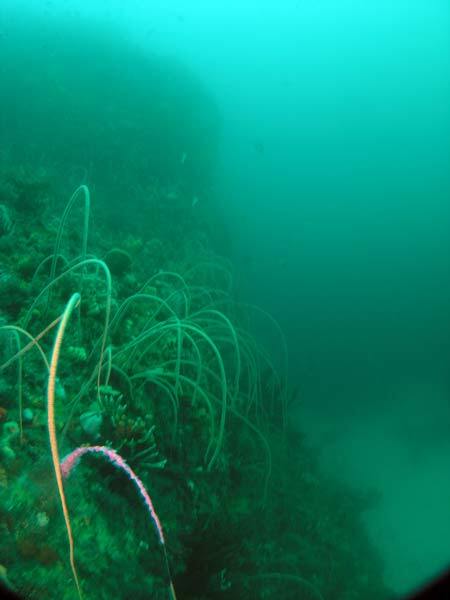 The reef is covered in sea whips and sponges. It is very colourful. Head back to the west and you will see the end of the main section of the canyon. Just before you get here you will see an object on the sand. 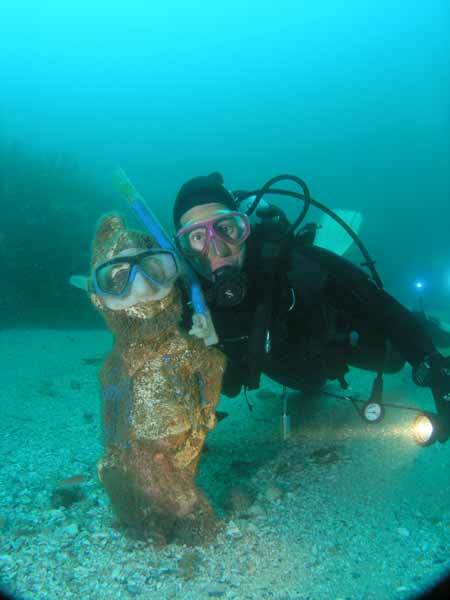 Closer examination will show that it is a garden gnome who is wearing a dive mask. This makes a nice photograph. On our dive, Kelly took the mask off and cleaned it so the gnome could see better! At least I think this is why she did it, perhaps she was narked! The canyon narrows just past here. There is also a garden frog on the reef to the north. The wall on the left (south) side is vertical, at least 15 metres high. The depth comes up a bit, to 35 metres at the end of the canyon to 33 metres in the narrower part. The wall on your left starts to turn to the left, that is, to the south-west. This wall is also very colourful. The wall continues to go towards the south. There are some overhangs here which have lots of abalone and crayfish in them. After a short distance you will see some large boulders ahead. These are located just off the main reef and form cracks and swim-throughs. However, before you come to the best ones, you will see a crack off to the left. This leads up to the top of the reef and should be remembered for the end of the dive. By now you will be in about 24 metres or so. Explore the swim-throughs and cracks and eventually loop around the boulders to return back to the crack that you saw before. 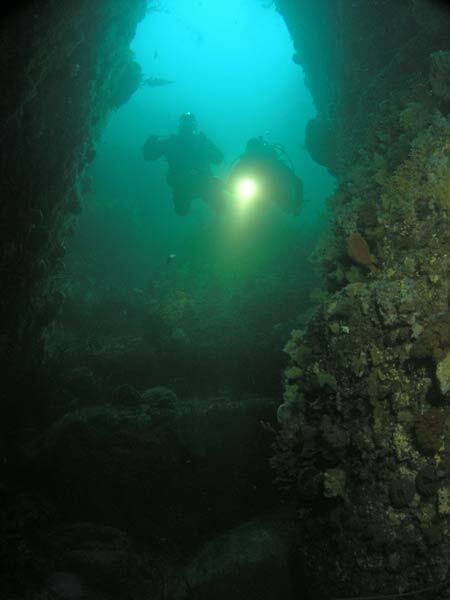 This section of dive is the same area that you do at the end of the Castle Cave dive. Follow the crack to the top of the reef and it will quickly rise from 24 metres to 18 metres or less. The reef to the south of the crack has as its peak "Mount Everest". If the seas are calm you can gradually ascend to there and complete your safety stop at the top in five metres. If there is too much swell you will have to do the stop off the reef. The reef top has huge amounts of kelp. You can get some very interesting photographs of the kelp, especially the very large and thick species, as it moves in the surge. 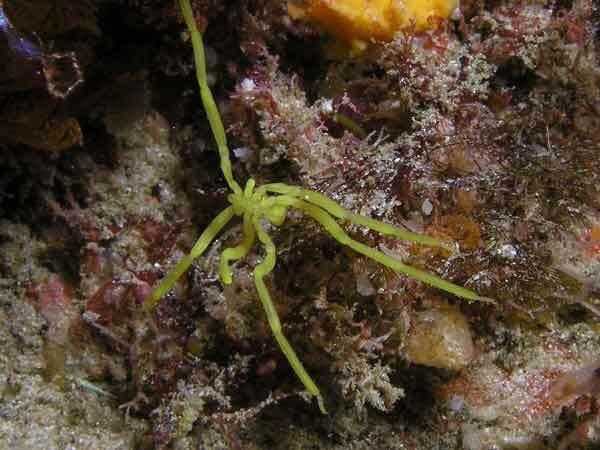 On the kelp you will almost certainly see lots of yellow sea spiders. Some of these have black bands on their legs. This is an excellent dive site. 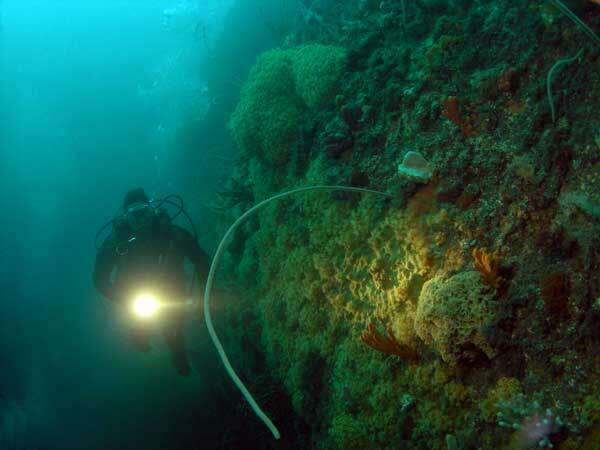 Visibility was about 15 metres and the water temperature 16ºC in February. A must do dive at Bicheno. The service provided by Bicheno Dive Centre was excellent and I can recommend Bruce's service to all.